Nickelodeon's ongoing animated reboot of Teenage Mutant Ninja Turtles (2012- ) has been quite the success. Now well into its fourth season with a fifth in the pipeline, it's maintained a remarkably consistent level of quality during the past four years. I've reviewed just about every volume on DVD thus far, and all but one (Retreat, the first volume from Season 3) have been enjoyable from start to finish. 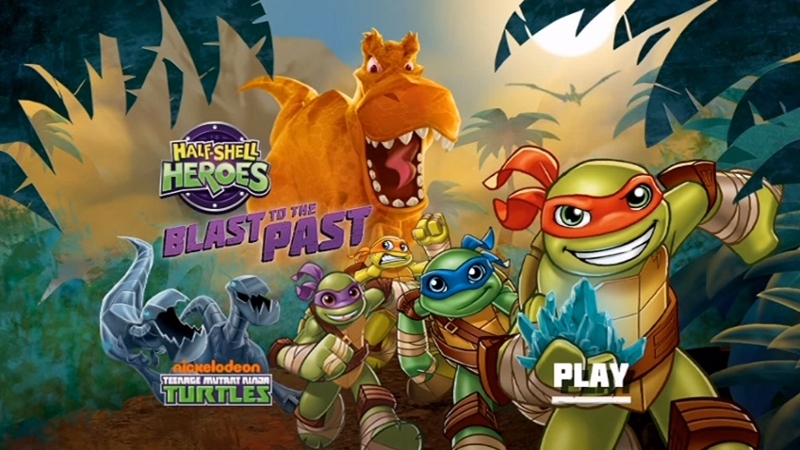 A few weeks into Season 4---on November 22, 2015, to be exact---Nickelodeon took a detour and aired Half-Shell Heroes: Blast to the Past, a new one-hour special designed to (a) test the waters for a slightly "younger" version of the show, and (b) sell a bunch of holiday toys. I'm okay with that first part. TMNT has seen countless adaptations over the years...and since most folks should be familiar with the 1987 animated series, they've already seen at least one "domesticated" version of the surprisingly brutal original comic. This isn't a complaint, mind you: the franchise's action-packed but ultimately silly core holds up to different takes on the subject matter (but not always), especially since it was first conceived as a not-so-subtle satire of superhero comics. In other words, the monumental staying power of TMNT is no longer a surprise: it's been around for over 30 years (heck, the Turtles' first appearance even predates industry landmarks like The Dark Knight Returns and Watchmen) and isn't going away any time soon, so let's just enjoy the ride. Based on what I've seen out of the franchise so far, the 2012 version has hit the sweet spot between drama, comedy, and general goofiness more than most...so it's good to know that Half-Shell Heroes actually doesn't stray all that far from its three-dimensional counterpart. The biggest changes are obviously visual: Blast to the Past is a flattened two-dimensional affair, with simplified character designs and a more vibrant color palette. Familiar supporting characters like April, Casey, The Kraang, and Splinter don't appear, either. But tonally, it's not too different: this time-travelling tale plays out like a light and simple one-off adventure (albeit one with a cliffhanger aimed at fans of They Live) with a familiar blend of action, comedy, and fourth-wall breaking. The joke count is higher, some of the rowdy violence is off-screen, and none of the darker elements from late Season 3 and early Season 4 are present. The familiar creative team and voice actors (Seth Green, Rob Paulsen, Sean Astin, and Greg Cipes as the four Turtles, as well as Fred Tatasciore and J.B. Smoove as Rocksteady and Bebop), combined with the stripped-down but recognizable character designs and present-day locales, should help 2012 fans feel right at home. That goes for new and younger fans, too...which makes it surprising that we haven't heard anything about a follow-up yet, as I wouldn't plop my younger kid in front of the 2012 series after what happened at the end of Season 3. But for now, Half-Shell Heroes seems like an experiment that plays out pretty well: there's little here (outside of a few easy poop jokes) that might turn off older audiences, and more than enough good stuff to please casual and first-time fans. Paramount's DVD serves up this lightweight, 45-minute production with a strong A/V presentation, but nothing in the way of proper extras (although there's a little something in the "Bonus Features" section). Presented in an anamorphic 1.78:1 aspect ratio, my only continued complaint about this series is that it still hasn't been made available on Blu-ray. Other than that, the 2D visuals look excellent from start to finish, boasting a vivid color palette and a flat appearance that suits this scaled-back version of the show very well. Black levels, which often dip into dark purple or blue territory by design and sport a distinct retro feel, are consistent. Image and texture details are also very strong for a standard definition release, and the prehistoric locales are often full of subtle variety and inspired touches. Aliasing and banding are present on several occasions (and honestly, they're almost expected on animated DVD releases), but it's no biggie when you consider all the positives here. From top to bottom, fans should still be happy...even if, like me, they're still wishing for a long overdue bump to high definition. DISCLAIMER: These compressed screen captures are strictly decorative and do not represent DVD's native 480p resolution. The Dolby Digital 5.1 track is also terrific, preserving the film's punchy and action-packed sound design perfectly well; although Half-Shell Heroes obviously isn't as dynamic and enveloping as its older brother from start to finish, it still sounds great and should easily impress fans of all ages. Dialogue is typically anchored up front and crisply recorded, while the sporadic (and mostly new) music cues are dynamic but not overpowering. Overall, it's an effective mix that gets the job done with no complaints. No optional subtitles are included, only Closed Caption support. As with most of Paramount's Nick DVDs, the simple interface (a whopping one screen, seen below) is colorful with a static advertisement beforehand. Despite the lack of a chapter selection screen, there are several stops during the movie. This disc is packaged in an eco-friendly keepcase with a matching slipcover and no paper inserts. Nothing related to Half-Shell Heroes, unfortunately, but you do get a random Nick Jr. Bonus Disc tucked inside a paper sleeve. It's a nice touch that adds replay value to this otherwise light release (and just for the record, mine came with Jimmy Neutron: Confusion Fusion, a collection of nine 11-minute episodes first released back in 2002). Like Nick's ongoing TMNT animated reboot, the sidestepping Half-Shell Heroes is another win for the franchise, serving up a light but wholly enjoyable adventure that aims to draw in younger audiences. Featuring a bit more humor, slightly less action, and a less threatening slate of bad guys (but very little that's completely "out of character" from the ongoing series), this fun little diversion is optional viewing for established fans but definitely worth checking out for a younger crowd or those itching for a little more TMNT as Season 4 chugs along. Paramount's DVD is priced about the same as those older six-episode collections (which look to be on their way out, thank goodness), but the lack of content is softened by a great A/V presentation and a random Nick Jr. bonus disc. Your mileage may vary as a result, but Blast to the Past is cheap and replayable enough to warrant an impulse buy. Recommended.